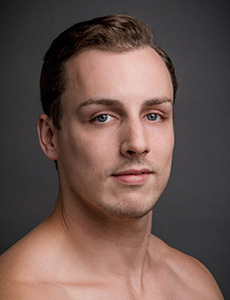 Alexander Castillo, of Bayside, Queens, joined Pittsburgh Ballet Theatre in 2016. Before coming to Pittsburgh, Castillo danced for six years with Los Angeles Ballet, where he was promoted to the company’s first male soloist position. He has danced featured roles in George Balanchine works, including Western Symphony, Serenade, La Valse, Concerto Barocco and Danses Concertantes, in addition to Jiří Kylián’s Return to a Strange Land. His repertoire also includes Giselle (Hilarion), Swan Lake (Benno/Pas de Trois), The Nutcracker (Prince, Arabian), Don Quixote and Michel Fokine’s Les Sylphides. He received his training with Ballet Academy East, The School of American Ballet and in summer intensives at Boston Ballet School, Central Pennsylvania Youth Ballet and the School of American Ballet.